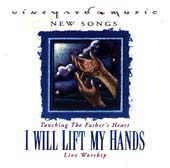 I Will Lift My Hands: Vineyard Music EXTRA! I do not know how those nice people at Vineyard music do it. I purchased their tape I Will Lift My Hands during a trip to Toronto and listened to it in the car on the way home. At first the songs didnt seem to be that significant for me (it was probably the jetlag) but after another listen I could not believe what I had found. Song after song which just seemed to be able to take where I was and express my heart to the Father. If you are looking for a tape that you can play when you want to Worship or declare your faith, look no further, this is it. Its a great mixture of different styles of song. Greg Reeve <Greg.Reeve@swi.galileo.com> lives in Calne, UK. Still learning about our great inheritance. He alone is my magnificent obsession. Favourite phrase: more Lord. Favourite activity: dance with all your might.